what are people using for a rear hydration set up. Has anybody found a good mounting bracket for the seat post screws? Yep they're buttons on the bars but they can only control your RD. Currently using 2 Gorilla cages on the bottom, I just upgraded to the PD Ultimate Steam and am waiting for delivery of the PD Aeria Hydration system which may not arrive till end of the month. UGH. I'm only running one bottle behind the saddle. But made a neat and cheap solution by drilling an extra angled hole in a sturdy plastic cage and zip-tie the top of it to the saddle. Its rock solid and lightweight! I bought this one for my Speedmax. I just called Canyon for the gazillionth time and they still don't have an ETA for the bottle holder. Im assuming the hole you drilled matches up with the seat post screw hole for the bottom? I called Canyon and they said August for the rear mount. I was just looking for an option for next weekend lake placid. I'm looking at ordering one of these and would like to know from existing owners how easy it is to remove the stem and bars for packing into a BikeBox Alan for air travel. In the photo the cables all disappear into the top tube storage box. Do you need to remove the box? I am also looking at the new 2019 Boardman ATT 9.0. One difference I have noted is that the Canyon chainstays are 20mm longer @ 420mm and the stem is 20mm shorter @ 90mm. The Canyon wheelbase is also 20mm longer @ 1037mm. This is for the large size, I am 188cm tall. Would I be right in thinking that this might result in the Boardman being a bit more twitchy / responsive and the Canyon being more forgiving and less stressful on technical courses? Both bikes are mail order only, so a decent test ride is not an option. The 2017 Boardman got very good test reviews for it's ride and handling but haven't found any tests / reviews that compared the two against each other. This will be my first Tri bike, my main bike is a Canyon Endurace with disc brakes. I live in the Scottish Highlands, so the roads are quite lumpy, hence my concern about handling, particularly on steep descents. Hi, I have 2018 Speedmax CF 8 and did two airtrips already. Preparing the bike for the fly and putting back together is piece of cake. Just have some carbon grease with you and you are all set. Am I somewhere off, any misconceptions on my sides? Did anyone measure the a real bike against the geometry chart? Is the geometry spec from Canyon a promise or more of an estimation? Anyone experience with high riser setups (for M size)? Is it still comfy to get to the bars then? Anyone experience in getting a shorter stem from Canyon? Would you run with the L being at total minimum height? Change in saddle, cleats, shoes could skrew me up heavily. I'm concerned that there isn't enough exposed cable to move the bars very far away when the stem is removed. The cables look like they are ziptied to something in the energy box, which is why I wondered if you need to remove the box? I know with my Road bike that the handlebars need all the slack cable to be able to fit them in a secure position in the box. My LBS got my cables pretty far away into my basebar. I'm riding a 110mm stem. Also, I've flown with my bike 6 times already and no problem. Super easy to take apart and put together. I've found that I can ride my CF almost like my road bike (Boardman Air Elite 9.8). I live in a very hilly and twisty area, and it handles very well. Three is enough cable (on my 80 stem) to put in on the side of the frame and secure. But be sure to put some sponge or buble plastic so the bar doesn't skratch from the frame. After lengthy discussions with Canyon's US service centers on the shortage of Speedmax CF 8.0 Di2 - I was given a subtle indication that some guys have been acquiring the Speedmax WMN CF 8.0 LTD. This is a Women's version of the bike, however specs are similar (changes in saddle, wheels, etc.) and the geometry is closer between the two than I would expect. I fit as "M" size on both geometries, after inputting my data. Is it too crazy to for a guy to use the WMN model? I like the aesthetics and would appreciate some opinions if you consider this feasible or not, and any other insights. Both geometry charts attached. Im pretty sure the actual frame is the same between the male and female models. Only difference be the length of the stem with +1cm on male versions, and then color scheme, saddle, wheels and other accessories as you also mention yourself. I have 0 spacers. As a matter of fact, I just removed the 4 cm plastic spacer below the stem and it seems to be the right hight for me. Only difference between the 2 is the -10mm on the stem for the W version. I bought a CF 9.0 W version last year. JTNY- could you post some pics of your PD front hydratation setup, pls ? I have a size M and i'm 5'11, I had to use ALL the spacers that were given to me. Done a few changes to my ‘bottom of the line ‘ Speedmax CF 7.0 2018 model and a small hack with the rear bottle cage i posted earlier. Here is my setup from last weekends race. PD Aeria Ultimate stem and hydration, F40 pads. Zero spacers under pads and I also removed the spacer under the stem. timppis - could you pls post some closer photos of your cockpit. I am curious how does Aeria reservoir fit in relation to a head tube, front brake cable and a front brake when installed on a PD Aeria Ultimate stem. Yes, I shortened the steerer. Before cutting it I trained couple months (winter time) inside on a trainer and tried if the lower setup suits me. I will post some close ups of the setup soon. The stem is rather heavy but I don’t see that as a huge problem. Is anyone running HED Jet Black / Jet + wheels with 25mm tires on the Speedmax CF? Any issues with tire/wheel fitment and rub? I don't think this will be an issue. The DT Swiss ARC 1400 real wheel on my Speedmax CF has a 28mm external width and came with a 25mm Continental GP Force. Fits perfectly. Hope this helps. During my first season, I've used a second hand tri-bike that has served me OK-ish but is definitely not a bike to keep for longer term so with the Speedmax CF 7.0 currently discounted @ €1799, this is the most interesting bike for next season. Easiest would be an SLX however that is a no-go (budget-wise). For the large, I feel the fit might be better but only if it would be possible to loose 20mm somewhere in the front-end (spacer)? is there such possibility? or could a lower stack base-bar solve the issue? Hi, been looking at the CF as where i live, tri bike options are limited, and just seeking clarification on how easy it is to change the cockpit, as looking at the pictures, the deisgn (shape) of the stem makes me think that it wouldn't be as easy as just putting any other stem on the frame. Is it a simple case of just swapping out stems, or is something more complicated involved? To explain, my road bike has a stack of 562, so the quoted minimum of 553 for the XS will potentially leave me unable to get as low as i want (sorry, it's not real-word geo for me). Could i work around it by just undermounting the T4 extensions? Also, I would need the lower stack nutrition box, but I can't see where I would order it from on the main Canyon webiste (I don't live in the US). Hence, would be grateful if you could point out where I might find it. Thanks in advance. PS: Do you have the standover height for the XS? You're absolutely right. The flare at the back of the stem is only there for negligible aero (cosmetic) effect as it meets with the front of the storage box. So yes, you will lose that effect if you switch stems, but it does indeed remove (with a pair of 5mm bolts at the base of the stem) from the steerer like any other stem. For sure, you can get lower, but will need to replace the Profile Design J4 bracket that comes with the bike, with their L2 bracket to get the extensions below the basebar. Totally doable. Finally, low stack nutrition boxes are in the same boat with the rear bottle bracket of the Speedmax SLX; we have no ETA on arrival into the U.S. for them as yet. I'm 184cm and went with M. Did two 70.3 and 5150 this season and the bike seemed fine. Now I'm trying to adjust the fit: removed the spacer under the stem so dropped it by 4cm. Swapped stem from 80 to 90mm and have longer extensions to be installed. After all those modifications my position will be super low and hopefully I can train during the winter to be comfortable with it for half/future full distance. At 184cm/6'0, you're a medium all day, so you 100 percent have the right size. And yep, take the winter to train to the position....but be sure to come up as you need, to be able to ease into it through the winter. Glad you're digging the ride, hope the fit and position comes together nicely! My wife just got the Speedmax WMN CF 8.0 LTD and we are looking at her race wheel options. She has an Zipp 808/404 setup she used on her previous TT bike, but the 808 isn't 11speed compatible (pre-Firecrest). My question is, how aero are the Reynolds Strike SLG compared to a 2007 808? I haven't seen any windtunnel data on the Reynolds. Thanks in advance! any advice on my "fit" issue for a speedmax SL? Would a Medium fit me if I would replace the stem with a 100mm Aeria? (would be my idea anyway to also include the hydration) or better to go with a Large and then use a lower-stack basebar? You should let a good fitter help you decide on size. Totally comparing apples to oranges here, but I am your size (185cm) and on my Aeroad I am a size XL. That makes a size medium sound small. Just because the existing hub isn't compatible doesn't mean you can't upgrade the wheel. Find a local quality wheelbuilder and have them lace a brand new 11s compatible hub to the 808. You just have to pay for new spokes (bladed is around $3 each or so...I think, and a hub, which can be $50-400 depending on how nice a one you want). Plus maybe an hour or two of labor to put it together. I'd personally get a DT Swiss hub (DT240s are really nice or to save a little money DT350 works well too but are heavier). Not necessary cheap but probably less hassle trying to sell that wheel and buy another one. Or you could do the 11s tricks out there for 10s only hubs. Or just buy they Edco monoblock 11s cassette (not cheap either but probably cheaper than rebuilding the wheel with a new hub though). At 184-185 cm a size M would be too small. I first ordered size M, but the frame felt too short - maybe suitable for short TT and sprint tri , so I replaced it with a L size Speedy CF and being 185cm, inseam 87cm it seems it fits well now. I did some 70.3 and it is very comfy. Swapping a stem or extensions does not solve the problem of having a short frame , your center of gravity is not where it should be. Unfortunately Canyon size calculator does not work for everyone. timppis or CanyonJay - What is the weigh difference between PD Aeria Ultimate 100m stem and Canyon 90mm stem? I’m currently looking at the Speedmax CF 7, which is on sale right now. I used PPS, and its advice was that I need a size S, which surprised me a bit as I’m 177/5’10” with a 82/32” inseam, 82kg/180lbs not flexible. It did note however that according to my height I would be size M, but due to an ideal seat height of 72,6cm according to PPS, I’m a better match for a size S.
So I concluded that I have short legs for a person my height. I currently ride a Cervelo S5 2012 in size 54 (stack 555, reach 378). Setup with drop bars, 90mm stem and rear seat post (73*) hole is comfortable. Setup with brezza tri bar 20mm rizer, 90mm stem and front seatpost (75*) hole, is too bunched up. I tried a lot of different settings/saddles. Only thing I’ve found comfortable was a longer stem 130mm. The longer stem works great on the trainer but is very dangerous for my biking abilities when riding outdoors. Can anyone offer me a view on the S vs M sizing question? Or is the geometry of the SpeedMax CF not a good fit for a person with my morfology. I'm about the same size as you. Ride a 56 Cervelo P3 (but I would have fit on a 54 too). Just bought a Canyon cyclocross bike and they recommended a small, even though I thought I would be medium. The small fits perfect. Awesome bike. The small cyclocross bike is very close in size to my 56 Cervelo. Indeed, our size labeling tends to run small when compared to other brands. I have ridden a 56 all my life, and ride a medium in Canyon bikes. So a 54 lines up perfectly for a size small. As to your morphology, best bet is to call our in-house team (phone number lives at the top of the website), and they can walk you through any outliers, etc. that may preclude you from one size or another. Obviously, there's going to be a variances in balance, etc. in Your inseam doesn't seem short, so I don't see there being much outlier. But I'm not the fit expert... give our guys a call and they can walk you through it! Does the CF come with a seatpost which is compatible with the Canyon bottle mounting kit? I'm not Jay but have CF 8 and just received seatpost mount from Canyon and it's compatible. When you look at the back of the seatpost there are two holes covered by rubber plugs. That's where the mount goes. Not an owner yet, but am weighing my options up at roughly £2k mark so I'm looking at the 7.0. Hopefully Jay or a 7.0 owner can confirm it's still the case with the seatpost on the lower offering. On a separate note: I'm torn between this and the P2. Any others which should be on my radar? I'm in the UK. Looking for primarily a good quality frame which justifies upgrades over time. Not really pursuing the 2nd hand market because I had lots of niggles from my last TT rig which I bought that way. I have a general speedmax question. I've seen a lot of talk about the frame storage in front of the seatpost but I can't find any information about it on the website. Does that storage area come with all models? SLX only? Right now I'm bouncing between the 8.0 Di2 and the SLX 8.0 SL but I'm curious if one, both, or none of those have the storage area. integrated storage compartment is only available on SLX model. It is in a rear frame triangle and in the top tube . This can accommodate a pump , CO2 cartridge and a very squeezed butyl inner tube. Special storage sleeve is provided for cartridges , which go further into the top tube. I have a Speedmax 8.0 Di2, prior to that I had a 2015 P2, while the P2 was nice the Canyon felt way more stiffer and handled better. the only downside is getting bike support, I get the stink eye every time I take it to a LBS for service. I'm looking to purchase a Canyon Speedmax, either the 8.0 or 7.0. Can anyone weigh in on whether the $1200 price difference is worth getting the 8.0 ($3700 vs $2500). In other words, how significant are the differences? Jay, I've seen people post a picture of the Speedmax CF with a slammed stem and a shorter bento box, does Canyon offer a longer bento box for the CF models? JTNY - very interested to see your post. I'm about 4 years on a Planet X Exocet 2. Served me very well and I think I'm finally fixed in a nice position(s) but now lusting for change. P2 / P3 has long been on the wish list Now Speedmax CF keeps making itself heard. I treated myself to an Aeroad CF SLX 2 years ago and I still absolutely love it like a new bike every time I ride it, always makes me smile. Never really believed top end bikes could be that much better than cheaper rides, bu I do now. Corners like it is on rails but also retains all day comfort, and yes, just feels stiffer. P2/3 looks like it should be faster to me but your comment makes me suspect I might always regret not going for the CF. My Exocet handles ok, but you can't take liberties with it or you're headed for the ditch. And I always wonder just how well the power gets transmitted. On the Aeroad it's like I turned into a climber overnight. Obviously a bit lighter but I'm sure it's more than that. Just feels like everythng you put into the pedal goes direct to the road with nothing being soaked away. You've answered the question already really but just to confirm - no regrets going from P2 to CF? Yes, there is a shorter bento box, but we don't have it available in stock in the U.S. I don't think there are many that have requested it, so it's not on the hot list the way the rear hydration brackets have been. Will come back to you with some intel... but it may be a non-starter for us, for now. But the more that request it, the more often it get run up the flagpole, and it increases our chance of stocking it. Will come back with some 411. Jay, what about a longer bento box which stretches further down the top tube? I own a Speedmax CF Di2 from 2017 and have been super happy with it in Races. The fit is perfect. However recently the cockpit has been bothering me more and more. I mean the cables from the bar to the di2 Box, the non-integrated aero bars etc. Have some of you addressed these issued with rebulding the cockpit? For example with an Aeria ultimate stem and base bar? Or in any other way? Or just get a new integrated frame? Really struggling with the fit of the CF before ordering. The size guide puts me on an XS - just sounds wrong to me. I usually ride with my saddle around 720 from the centre of the BB. My road bikes are always small or 52cm ish. I'm 5 foot 6 - longer legs, shorter arms and torso. My last bike, a Dolan Scala, fitted really well with an 80mm stem and the saddle all the way forward, but I'm struggling to compare the measurements. Just need someone to look at them both and say yes, an XS is correct! The last bike of which you speak, it's a tri bike, right? And are/were you comfortable on that bike? Would you want the new Speedmax to fit pretty much the same way? I'm asking because I can walk you through a pretty simple process of measuring the Pad X and Pad Y of your current bike and then we will KNOW - not only what size is right (if it's the XS or the SM)...and...specifics on the front end set up. Yes it was a tri bike and it was Ironman comfy. Unfortunately it's now gone so I can only estimate the dimensions. The only dimensions I kept were my saddle height (720mm), the distance from the nose of the saddle to the stem cap bolt (420mm) and stand over height (740mm). I've since played with the Canyon PPS and for my height, my torso and arm length don't affect the size. It's the inseam length that makes the difference. I'm about 81cm which puts me on a Small. If it was 79cm, it puts me on an XS. Isn't the consensus to go smaller on a TT frame? Saying that, Small might give me the best options as it comes with an 80mm stem so I can go a bit shorter or longer does that make sense and that I should order a small? I'm 5'11" and ride a medium and should really be on a small frame. At your height a xs sounds correct. To answer your question directly, if both an XS and a S will fit...the bigger bike would perhaps be better for handling (considering the wheel base, front center, trail, etc). but..hold on....I'm hoping you have the patience to work through this with me. The PPS is good. But knowing your Pad X and Pad Y is best. Get your existing bike level: the best bet is to put in on a trainer with a wheel block under the front wheel so it's level - but you could just lean it against the wall (on a level floor) so that the bike is as straight up and down as possible. I'm going to ask you to measure a couple of things and to do this most accurately you'll want work on the non-drive side. Measure from the floor up to top of your arm pad. Then measure from from the floor up to the center of the bottom bracket. Do the measurements a couple of times and get an average. Subtract the BB (bottom bracket) height from pad height. If you've doing this in inches then please go here and convert to millimeters. This is your Pad Y (also known as Pad Height). Now, we need to find Pad X (aka Pad Reach). To do this you might need a hand from a friend or family member. Have them dangle a plumb line through the center of your BB (so they can hold it near the front of your saddle and then you can crouch down and guide to back up a hair or go forward a touch to get it dead center on the BB. Then measure from the plumb line to the back of the pad and to the center of the pad. I'd like to know both please. Convert this number to mm and you'll have your Pad X. Get back to me here with your Pad X and Pad Y and I can confirm your bike purchase. If you have questions hit me back and I'll solve it. Pat. Hold tight. I can math out from saddle height and come up with a pretty good number. I'll get back to you ASAP. Here's a pic of my last TT bike. I have a Wattbike Atom so could loosely replicate any given dimensions to try. Indeed, it's possible, but Jan (as well as Team Katusha-Alpecin, as I noted on their bikes at Tour of California) cnc'd Wahoo Bolt inserts. We only offer a Garmin insert (given the brand's sheer popularity/volume) those inserts would have to be a Wahoo product. I've meant to reach out to them to find out if they will be making an insert that will work... lemme get back to you! There is not for the CF. Being a standard 31.8 basebar (or a 22.2 extension), there are too many good computer bracket builders (K-Edge, RecMounts, BarFly, Zipp and Garmin typically provides their own with computers, etc.) for us to produce one. How or where do you guys buy adaptors for you speedmax cockpit? Does the bike come with a set of different angles and stuff? I've just purchased a Speedmax CF and am wondering if anyone else's nutrition box sticks out and if so what adjustments were made to get it back behind the saddle post? Due to the 3 wires coming up through, mine bulges out the sides which obviously wont be great in an aero race. Any insight as to when the Speedmax WMN CF 8.0 LTD will be available in XS in the US? It's showing available on the European site. If you're looking for Speedmax SLX adaptors, at the moment the best way to get them is to call in; we haven't yet updated the website with many small parts, so whether it's rear bottle brackets (which we had a limited supply of at last check a few weeks ago), angle wedges, switch plates, etc., it's best to call 833.226.9661 and ask for the pieces you are seeking. The bike comes with spacers in 5mm increments that can stack up to 80mm high. We're scheduled to have a limited number (five) models hit the website the last week of this month... in just under two weeks. Check then, but be sure to sign up for email notification, and you'll get an email when the XS is live and in stock on the site! Sorry... that was to say, five "copies" of the XS bike that person was interested in. Five XS bikes in this shipment, that is. Sorry, I misread that....wishful thinking perhaps! Do you have a rough estimate on when you think the US site will have CF SLX9.0 small bikes available? There were a few available last week (2018 model) in size Small. I got mine in that group. No i did not get the email alert i signed up for though. Is there any update on when the 2019 CF8.0 Di2 will be available in the US? The new blue and black styles are available on the international site and are sweet! I see that frame is in the US for the LTD model but not the standard yet. Will that be coming? If anyone is looking for the seat post water bottle cage mount in North America, they have it available on the backend, not on the website yet. Just ordered one. Very straightforward, at least with the di2 wires. I just unplugged the wires from the junction box and routed cables trough the stem and reconnected. The front brake was easy also, the cover of the cable just a bit too short but I got it to work (didn’t have time to tinker with it and put a new cover). The rear brake cable doesn’t go trough the stem. hrm wonder how bad it would be for mechanical setup. Might have to do a bit more investigating because the finished product does look clean. Does anybody have a recommendation for a hard travel case for the CF? nervous about a bike bag for flight. Can anyone show me what this team switch plate is? The teams switch plate looks like the standard switch plate, but has more length in it, allowing it to be flipped fore or aft to provide not only more width adjust (as the standard switch plate does) but also that added fore/aft pad placement. Photo attached. As with a few accessories (including our rear bottle holder for the Speedmax SLX and CF), it's not on the website, but we do have them in stock. Just call our guys here in Carlsbad on our toll free line (833.226.9661) and you can order it. The Team Switchplate is $20 a set. How does this affect arm pad tilt? If it does how much tilt can u still get? Does not affect the tilt at all. I have been using the Premiere Tactical Bike Box since getting my SLX, bit pricey but has been a great case thus far. As far as a "bag", I would look into the EVOC, even though it is "soft" it is a great bag, very well constructed and I had no issues with it over the 4 years that I owned it and probably into the ~100 flights with it. What's the max tilt you can get out of the bar? Are you talking about the CF or the CF SLX? From what I know the CF is more of a "standard" Tri bar/stem and you can adjust the tilt really easily at the extension clamps, no additional hardware is needed. If you are talking CF SLX (integrated bar/system), then you do need additional hardware and it is a set tilt of 9*, see pg 57 top right (https://media.canyon.com/...479096960.1502819710). Brad's exactly right. 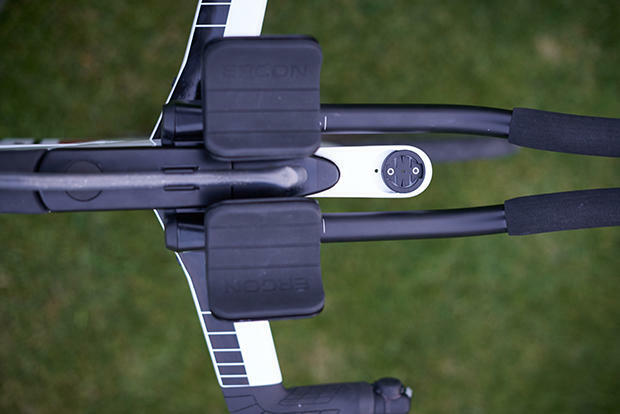 The Angled Spacer Kit is totally separate piece that provides aerobar pad and extension on the SLX angling. And indeed, if you're on a CF, it's a standard 31.8 basebar and stem interface, in which case the Profile Design T4+ clip-ons can pivot on the basebar as you like. If anyone is interested, Canyon NA just got some CF in size large and medium in stock. If you go to and click any of the models, scroll to the bottom of the page. There, you'll find the stack/reach numbers for a given size. That said, those numbers are with stock pieces. Per usual, I don't have a switch plate on hand to measure against, but having seen one, I can say with some accuracy that it, installed in its "fore" position, will provide those extra 3cm of fore positioning to get your reach to 580. I'm not mechanically inclined enough to fully remove the 35a extensions and measure them...and overall having a hard time judging this since the base of the extension is enclosed in the subsonic bracket. I can see a "cut" mark but not sure what the length between the base of the extensions and the cut mark is. Is a 3 inch / ~75mm cut normal for these? Cutting the extensions drastically is pretty standard with the Subsonic, they're sized so that a tall rider with the pads forward still has options. There is 40mm (~1.5in) adjustment capacity in the Subsonic bracket so you're not locked into one length. They do require more precise cutting than the Sonic bracket equipped bars. The reason for Canyon using the Subsonic is that too many people were shoving the extensions way back on the old J4 bracket and causing problems. I have the same on my CF, I choose to keep my seat rail based holder instead as I heard the Canyon bracket sit a bit too low for some riders, you should reach out to CanyonJay for details. I have finally managed to tweak my Speedmax the way I wanted, with Aeria Ultimate Stem + Hydration system combo. I thought I'd share that with y'all, cheers! For reference, I did end up getting my LBS to take ~40cm off the bars, and now they fit perfectly. A size M was the right call for me at 5'9 with a 33" inseam (measured from crotch to floor wearing cycling shoes, using a text book between the legs to measure down from). How was installation of the stem? also - any pics of how flush it sits against the rubber bento box? Does canyon have a stem with a positive rise that will fit the CF? I need to come up even more than the risers allow and I really do not want to use a different stem not fit to look flush against the box. Has anyone figured out a better solution than electrical tape to ensure the spare compartment door in the top frame tube doesn't pop out/ off while riding? Lost mine during a race last weekend. Now I have a big hole in the top of my frame.... Yes Canyon is replacing it, this time. that looks nifty as heck. mind sharing which length stem you used, and if there are any spacers under it? I can't tell from the photo. was it hard to setup? Thanks! It does look exactly as I expected and I am pretty happy with the setup. I went with the 100 mm one. Bike is size M, I am 181 cm tall, and I would have gone with an even longer one if it were possible. I have replaced the armpads, too and went with Profile Design Ergo instead of the stock F35, and I will probably need to get longer T4 extensions, too. There are no spacers underneath the stem, although originally my bike fitter suggested using a 10 mm one, the stem would not sit flush against the bento box. It is not ideal (I will post detailed pictures soon), however it is close enough and I am quite happy with the outcome. Although I didn't install it on my own (shoutout to my bike mechanic Janisz from Olimpius.pl in Wrocław, Poland), the setup wasn't that complicated. Cable routing was trickiest to get right, especially considering my mechanical Ultegra setup, but eventually we figured it out.